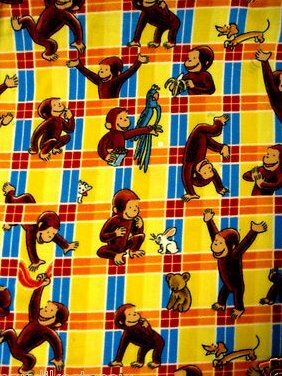 Curious George plaid Licensed handmade fleece baby blanket 29"X35"
The pictures may vary in order as I cut down the bolt. This licensed Curious George handmade blanket is soft and lightweight.The edges are finished with serged stitching, and the corners are rounded.Smoke free workplace of professional seamstressAll work guaranteed New handmade by me fleece blanket depicting Curious George. rare fleece baby blanket or Toddler drag along, comfort day care, or car seat snuggle "blankie". Measures approximately: 29"X35"